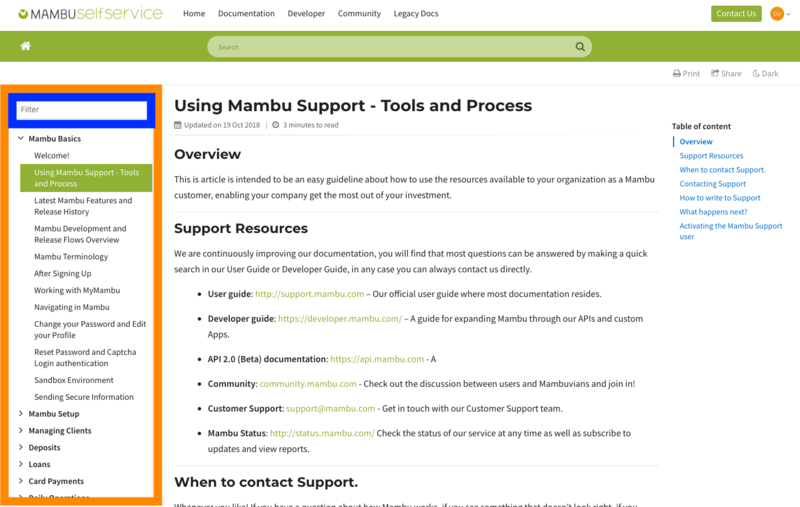 Welcome to Mambu's new developer documentation! As of December 3rd, 2018 our developer documentation has a new home, alongside our user documentation. We are no longer updating our previous developer website, but the contents will available until the end of the year at http://legacydevdocs.mambu.com. We hope you'll find the new Self-Service website informative and easy to use. Please consult the paragraphs below for more information about the new portal. 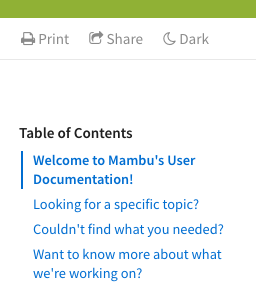 Please feel free to share your feedback about the new developer documentation in the Mambu Community. When articles have multiple headings, the Table of Contents will display on the right-hand side of the screen. The current heading will be bolded and this will update as you scroll. Click on any heading to jump directly to that portion of the page.